HubSpot's integration with SurveyMonkey allows you to use SurveyMonkey data in HubSpot to segment and qualify your contacts. Use the search bar to locate the SurveyMonkey integration, then hover over the integration and click View integration. In the dialog box, click Connect to SurveyMonkey. Enter your SurveyMonkey credentials and click Log In. On the next screen, click Authorize to give HubSpot permission to access your SurveyMonkey account. If you have created SurveyMonkey surveys, they will appear here. If you haven't created any surveys yet, click the Create your first survey on SurveyMonkey to go to your SurveyMonkey account and set up a survey. You can collect survey responses in HubSpot with either an email invitation collector or a web link collector survey. If you're using an email invitation collector survey, your survey takers must access the survey via the survey link in the email they receive, sent from SurveyMonkey, which is unique to their email address. Additionally, you do not need to have an email address field on your survey, since SurveyMonkey automatically grabs that information from the referral URL. Include a Contact Information question with the Email address field. The question can be added anywhere in your survey and the Email address field label can be in any language. Include a Single Textbox question in English that has the word email as the first question in the survey. If both the above ways are used in one survey, the email addresses submitted to the Contact Information question will be synced to HubSpot, not the email addresses submitted to the Single Textbox question. Please note: if you have a Basic or Standard (Select) SurveyMonkey account, you can only use an email invitation collector to pass data to HubSpot. SurveyMonkey Advantage (Gold) and Premier (Platinum) users can use email invitation collector surveys and web link collector surveys. Read more about SurveyMonkey's plans. To begin syncing respondents to a survey, click to toggle the switch on in the Sync column. Please note: HubSpot will not sync a respondent if their response is incomplete or they are disqualified. If there are already respondents on your survey, HubSpot will sync that data, along with any respondent data going forward while the sync is turned on. As soon as you receive a response to one of your surveys, this data will sync to HubSpot in a matter of minutes. Any new email addresses will be created as new contacts in HubSpot; existing contacts will have the survey data added to their existing contact record. Respondent responses will not be added as contact properties; however you will be able to view and segment the data on individual contact records and in lists. Click the name of a contact. At the top of the contact's timeline, click Filter activity, then select the SurveyMonkey checkbox. 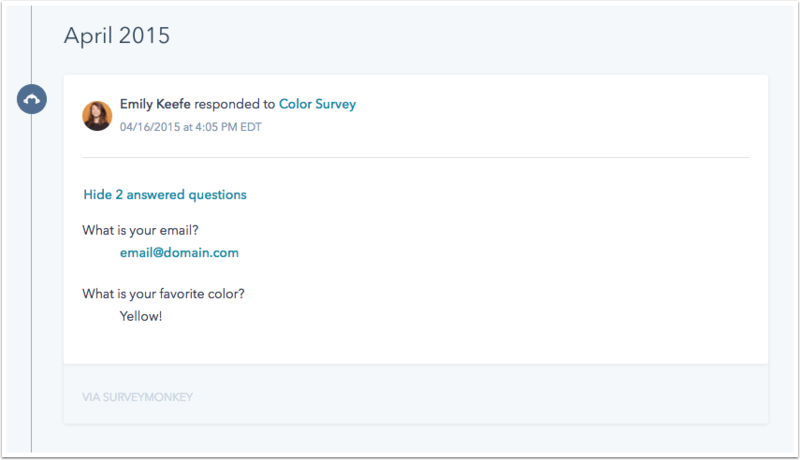 SurveyMonkey responses will now appear as activities on your contacts' timelines. If you have an annual paid SurveyMonkey plan, the timeline event will show a breakdown of your contacts' responses to specific questions. In the upper left, click the pencil icon edit and name the list, then click the dropdown menu and select if it should be an Active list or Static list. In the Filters section, select SurveyMonkey response. Click the Contact has responded to survey dropdown menu and select a survey, or click the Contact has not responded to survey dropdown menu and select a survey if you want to create a list of contacts who have not yet responded to a survey. If you're on an annual paid SurveyMonkey plan, you can further segment the list based on specific responses to the survey. Click the and the response to dropdown menu and select a question, then set the response criteria. When you're done setting up your criteria, click Done at the bottom. Add additional criteria to your list if needed, then click Save at the top right. Please note: the above segmentation criteria are not available in Marketing Hub Starter accounts. 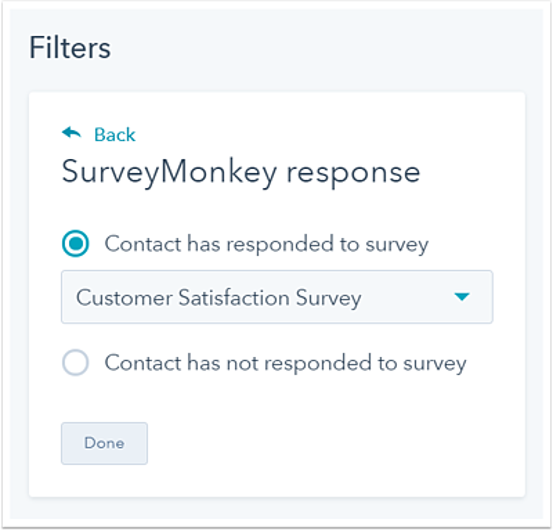 If you have the HubSpot-Salesforce integration turned on in HubSpot, SurveyMonkey responses will also appear as activities in the HubSpot Visualforce window in Salesforce for your leads and contacts.